COLORADO SPRINGS, Colo., Nov. 5, 2018 /Christian Newswire/ -- A campaign to concentrate focus on reaching those who have yet to hear the gospel is gaining further momentum with the addition of four more leading missions groups to its organizing partnership—and the accompanying hope the rising wave of support will result in a global flood of new believers. 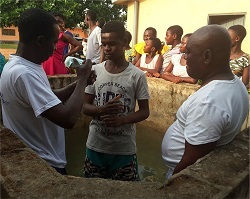 Photo: A young deaf man in Ghana is baptized after coming to Christ through the ministry of ADOOR International, one of four new members of the Alliance for the Unreached, organizers of the International Day for the Unreached championing a greater missions focus on those with little or no exposure to the gospel. DOOR International, Far East Broadcasting Company (FEBC), The Seed Company and TWR (Trans World Radio) bring to 14 the members of the Alliance for the Unreached, which hosts the annual International Day for the Unreached (www.dayfortheunreached.org), to be celebrated for the fourth time on June 9, 2019—Pentecost Sunday. By informing people more about the needs of these unreached, the alliance hopes to spur greater support for and involvement in new missions endeavors that will help fulfill Jesus' Great Commission to "go into all the world." "The International Day for the Unreached continues to gain more traction every year," said Alliance Chairman Jon Fugler. "The four new members we welcome are doing distinct work to bring the gospel to the unreached, and their distinctives round out our team. "It's fantastic to see the commitment of quality missions agencies like this as we come together to mobilize believers," he added. "I'm thrilled we have such great organizations working together to raise the flag for unreached people groups in some of the hardest places in the world." DOOR International (doorinternational.org/) focuses on the world's 70 million deaf--only two percent of whom are Christians, and who comprise 20 percent of the remaining unreached, unengaged people groups—through sign language Bible translation and deaf-led evangelism and church planting programs. "We are honored and grateful to join the ranks of other alliance organizations and highlight this critical area of the Great Commission," said Door International President and CEO Rob Myers. "The Alliance for the Unreached is helping bring awareness to the great need for the gospel still remaining worldwide today. Together we can ensure everyone has access to the precious, life-giving message in their heart language." FEBC (www.febc.org) was founded in 1945 and currently operates 150 AM and FM stations worldwide, reaching people in remote places with programs in 149 languages. Each year, the organization receives more than 2 million listener response letters, texts, phone calls and emails from China alone. "We are pleased to join the Alliance for the Unreached," said FEBC President Ed Cannon. "Our mission closely aligns with the alliance's commitment to reach the least-reached, 'forgotten peoples' of the world. We look forward to locking arms with other members to reach those who have never heard the good news of Jesus Christ." TWR (www.twr.org/) was founded in 1952 and today is the most far-reaching Christian media organization in the world, with programs in more than 230 languages and dialects in 190 countries, broadcasting on shortwave and AM and FM radio and by cable, internet, satellite and mobile devices. "Jesus said the whole world needs to hear about the good news about his reconciling each individual to God," said TWR International President/CEO Lauren Libby. "We, at TWR, are delighted to be a part of the Alliance for the Unreached." The Seed Company (seedcompany.com/) was founded in 1993 to help accelerate Bible translation work and bring God's Word to the 2,000-plus languages still without scripture in their mother tongue. The organization has completed 900 projects and initiated another 140. "We at Seed Company consider it an honor to partner with IDU in reaching the 2.5-plus billion people who still have yet to hear the gospel," said Matt Knisely, The Seed Company's VP Marketing & Product. "We are excited for what is happening through our strengthening body and generation to propel God's Word across his kingdom." Held each year on Pentecost Sunday—the day when the Holy Spirit fell upon the early church, empowering members to take the good news to the ends of the earth—the International Day for the Unreached features inspirational reports of what is being done to reach those who have not yet heard, and a challenge to respond to Jesus' command. The International Day for the Unreached (www.dayfortheunreached.org) is an initiative of the Alliance for the Unreached, a group of evangelistic ministries and other organizations, comprising Bibles For The World (www.biblesfortheworld.org), DOOR International (www.doorinternational.org), Far Eastern Broadcasting Company (www.febc.org), Frontier Ventures (www.frontierventures.org), The Joshua Project (www.joshuaproject.org), Mission Network News (www.mnnonline.org), Missio Nexus (www.missionexus.org), Operation Mobilization (www.omusa.org), Partners International (www.partnersintl.org), Reach Beyond (www.reachbeyond.org), The Seed Company (www.seedcompany.com), Trans World Radio (www.twr.org), William Carey International University (www.wciu.edu), World Mission (www.worldmission.cc) and ZimZam Global (www.zimzamglobal.org).